Not the most original title but it's the best I could come up with for now . . . .
Out and about in the fresh snow of February with the forecast of more on the way. What I really want to know is, what happened to January? Impressive pictures of weather conditions I’m so glad I don’t have to cope with. Stay warm and well. These pictures were meant to inspire a longing to be here, sharing the fun and exhilaration but thank you TiTi for your kind words and wishes! I know, that was the shortest January I can remember. I thought it was because I’m getting old (63 tomorrow), but you’re still young. Great pictures. 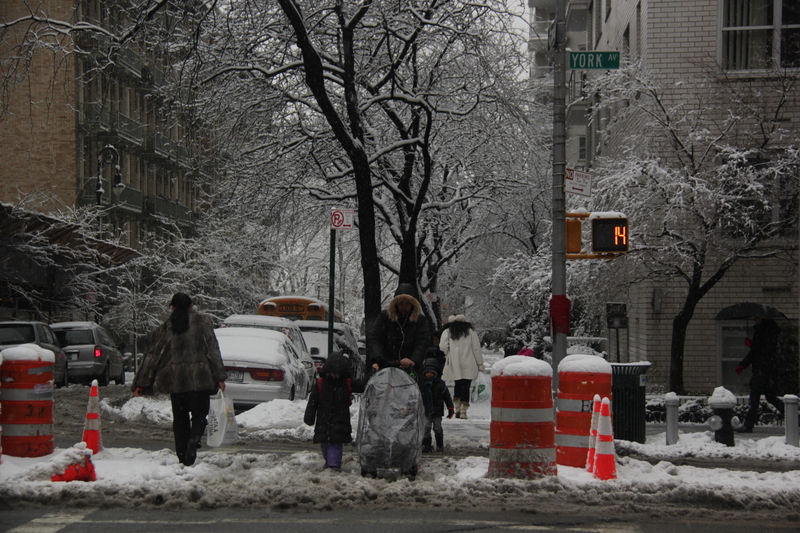 The trees look so pretty, the streets look so yucky. Love the dogs with the boots. I love New York, but I’m happy to be in CA. Happy Birthday wishes to you!!! Hope you have fun celebrating in the warmth of California! It’s warm enough, but it’s raining (which is good actually!). Thank you Margie! It’s harder to keep the lens dry in the rain than it seems to be in the snow – most of the time I carry my camera over my shoulder but bad weather winter I wear it around my neck and down the front of my coat between shots. I look like a bag lady. I can feel the cold in your photos over here, half way across the world. Interesting to realise how useful the umbrella is. A shield from rain or snow or bright sun. Not to mention all those things John Steed could do with one. Hope it is a little cooler where you are Lignum and yes, the umbrellas must be out almost everywhere! Oh, how I feel for you. Incredible! Did you stop in at the Banshee Pub? You are so kind, thank you Angeline! Maybe one day I might stop in at the Banshee, for research purposes! When life gives you snow, take great pictures! Lovely! A great point to remember, thank you so much doublewhirler! Just as you left it! Doesn’t seem that long ago does it? 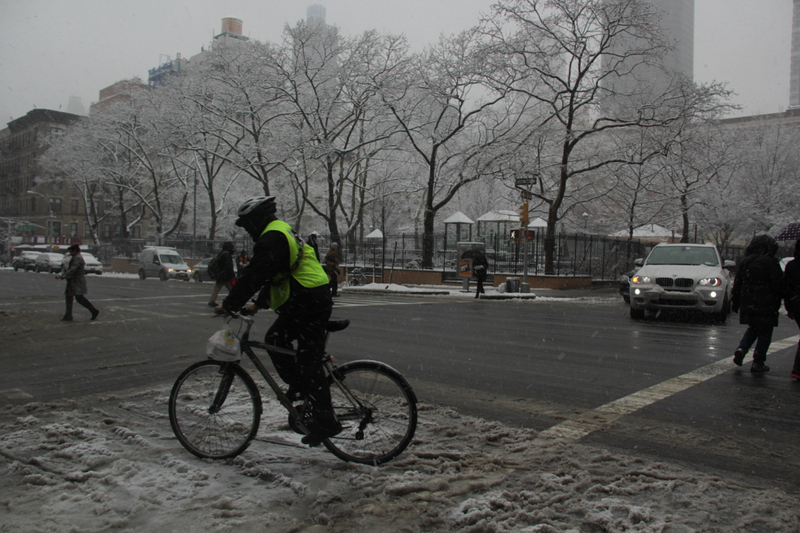 I am surprised so many people are in the snow without gloves on. 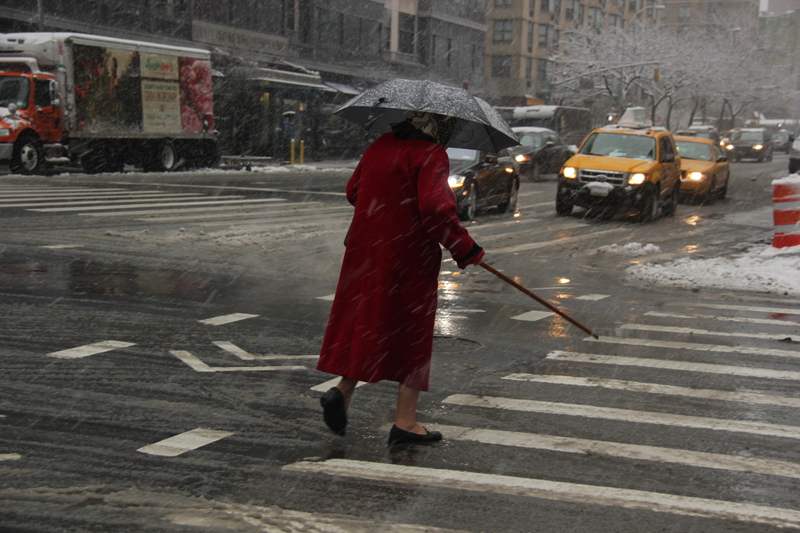 The red coated lady crossing the street , NO SOCKS! 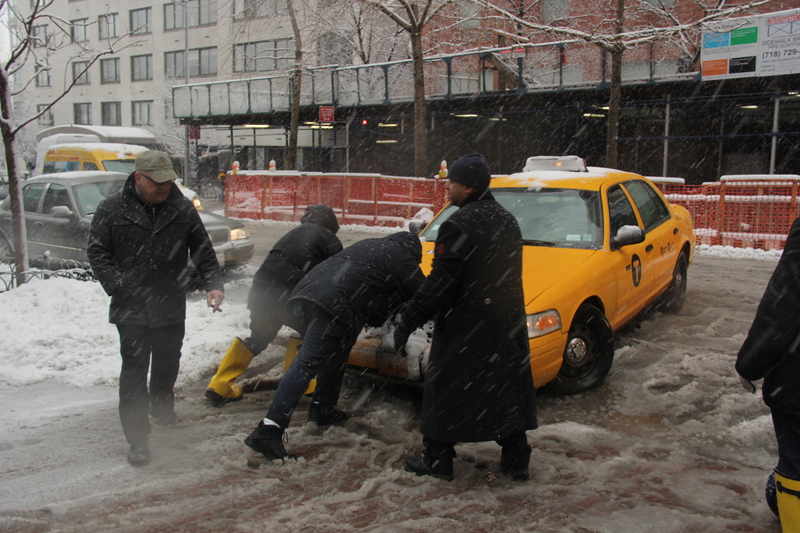 New Yorkers must be tough as old boots. Riding a push-bikes can’t be easy either. Lovely atmospheric photos. What I would not give for good snow here. Gerard, the really tough ones come down from the north to teach the wimps a thing or two about the cold weather! Plus, not sure you want to know this but it was a balmy 34 degs F that day. Hope it cools down for you soon! Fine series, Patti. Gives me the shivers; and I hate that grey tire-soup. That tyre-soup is a nightmare . .. . The colors! They make me happy, despite the weatherconditions. Your happiness makes me very happy, thank you so much Han! So different to sand between your toes! 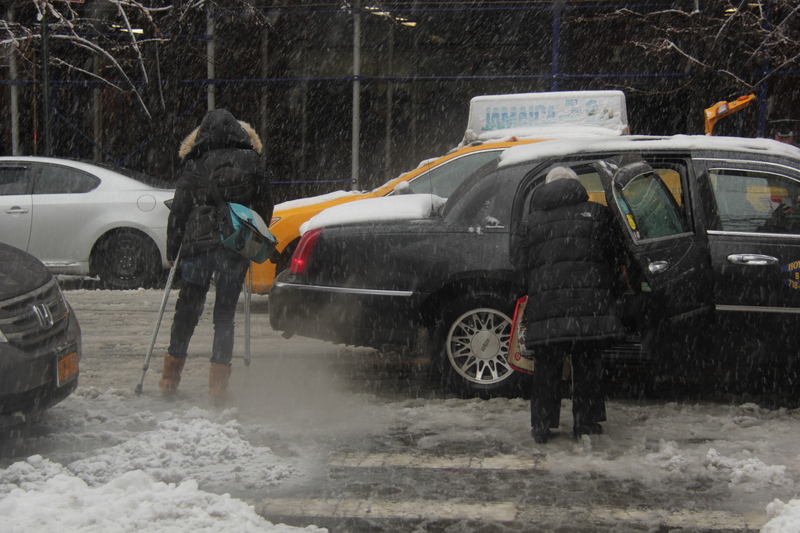 You don’t like the thought of NYC winter thrills? See you in the spring!! It sure is, thank you Bente! A rainy winter can be so dreary and draining, hope you get some snow soon Robert. Still in the early days of Feb . . .
realistic winter documents, Patty – you’ll smile about this gallery in August! From this point Frizz summer seems like a foreign country! Superb captures Patti, so very atmospheric with wonderful subjects. Brrrr! Thank you David, you would love it this time of year here with your camera! Love you in black and white but truly love you in color. Guess what? More snow coming tomorrow and the weekend. My feelings? Holy crap. You take care Tom, it seems so much icier today . . . . and thank you for your kind words! …though what I read on the news I thought it most have been worse – but maybe that was other parts of the US. Thank you Rabirius! Atlanta and other parts of the south were hit badly so that’s what you might have heard about recently. 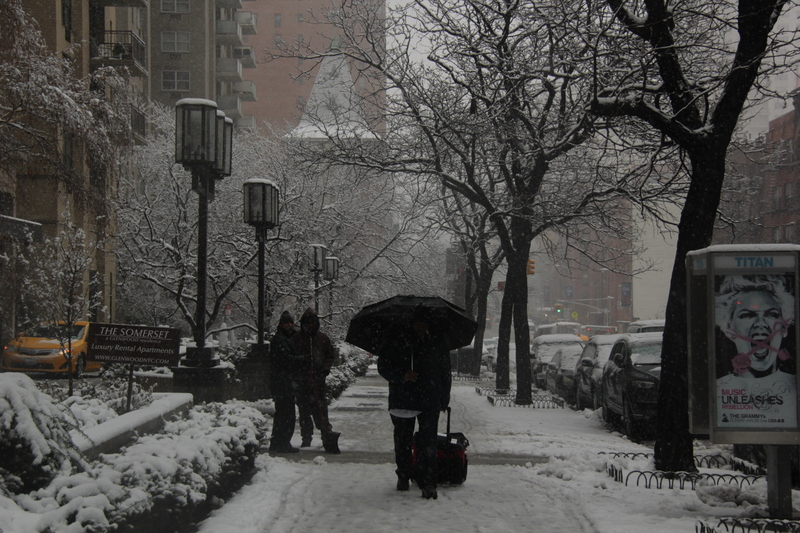 NY and the north-east were hit with heavy snow, cancelled flights, the whole nine yards and more the week before. Welcome to winter in the US! Heavy & Wet but Beautiful! 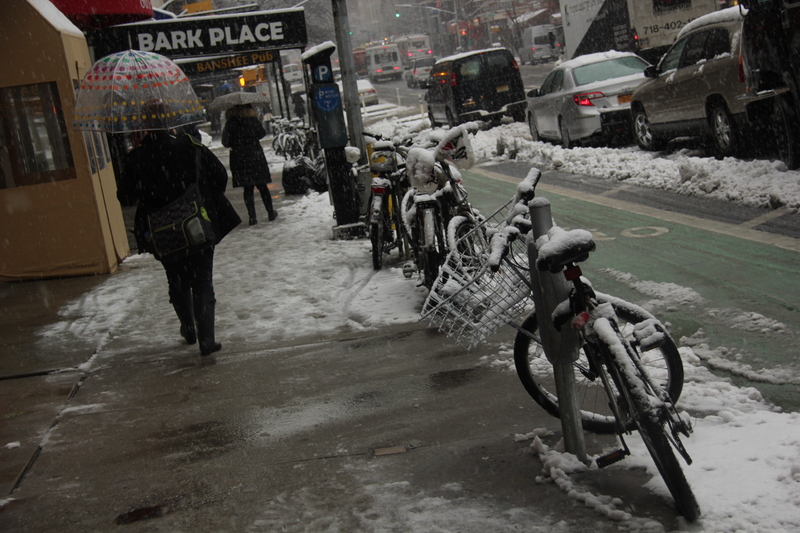 Did you bring this weather back with you from CO… :>) If so thanks – i love winter in NYC ! So no retiring to Florida for you Pat! 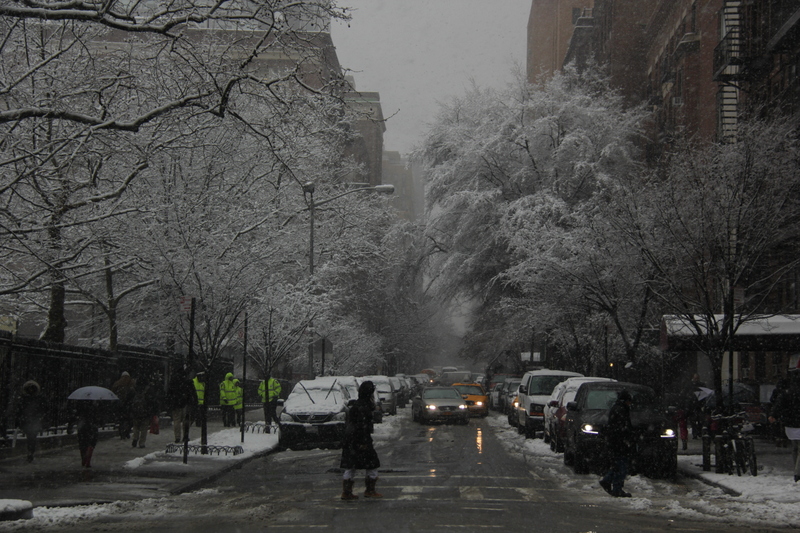 Am with you on the winter love in NYC – this recent batch was so pretty on the trees everywhere wasn’t it . . .
wow, the first one is an instant classic! great shots. Thank you dothob – I admired her wonderful sense of purpose in the circumstances! I often wonder if the pooches are as hard to dress for winter as small children are? Keep warm Christine, you hardy soul of the true north! Thank you Beth, hope you manage to get out into the big white soon with your camera! Perhaps you are busy cooking and shooting inside instead? Look at the trees in the seventh shot! Goodness gracious! What street was that? It’s been a frigid winter in the Northeast. I’m thinking this summer is going to be even more a scorcher than the past two. Place your bets now! This must be semi-tropical in comparison to your Ontario winter and yes, you could be well right about summer . . . I feel cold just looking at these! Wow what weather you are having! Cold, wet and windy here, but no snow yet this winter… I love that first image especially. A little cold wet and windy goes a long way doesn’t it . . . . Thank you Emily and hope you are keeping warm and dry! Winter pure … wow. Great capture and moments, Patti! So different to when you were here! Thank you so much Anette! Thank you Joshi! Others might refer to it as a great mess! Great shots, Patti! Love that first one to bits! That’s so good to hear, thank you so much Richard! 7 years on that coast. February is a month for lots of early nights, near the heater, reading Auden as we recall. TG, thank you so much for your sunshine waves and company all the way from lovely LA!! Not to mention how good an early night with Auden would be! Absolutely! Until the coffee, morning time exists in a cone of silence! It’s crazy over there now! And still more crazy to come Cardinal, snowing again now . . . Snow .. 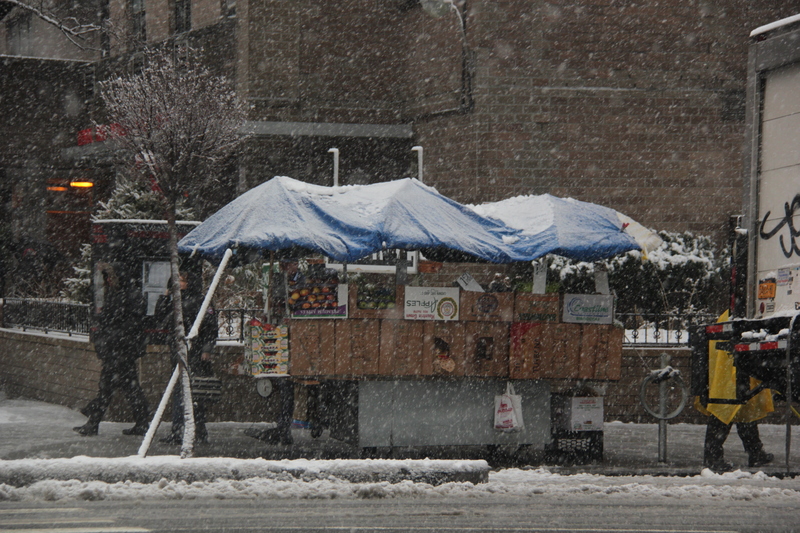 Snow … Snow …. winters coat. I used to dislike the mess of it all. I thought it was great. Mmmm … then, the kids came in with their wet boots and clothes. my Paradise – Florida. Good Job on bringing me back to reality as I thought I was missing snow. Happy to be of service Issy! I remember being down in Miami during February some years ago and wondering why on earth people were wearing puffy jackets in such beautiful weather! Snow folk are a special breed of tough! I’m a complete wimp! We all have our wimp points!! Oh yeah! I’m familiar with the scene, but NOBODY captures it better than you. Now Elena, you are way too kind!!! Great series, will this winter ever end? Unlike yourself, I find it hard to get motivated to go out in this weather with my camera, I can’t wait for spring to emerge. We take our motivation when and where we find it Mark, I so hope it warms up for you soon! OMG! Great captures, Patti – love them! You are sweet, thank you so much Dina! We have more snow to come but I keep thinking of the rain that never seems to stop back in the UK . . .. hope all well with you! Fantastic shots Patti! ‘Who needs boots’, ‘Fresh Fruit’ & ‘Caught in the crosswalk’ in particular! Try as I might I can’t bring myself to feel a longing to be there in that weather 🙂 Stay warm. It’s amazing what you get used to Madhu! Thank you so much! Hope it is warming up for you now Paula! I could say the same for you and the rainfall in the UK Martin, what a dreary winter . . .
Lovely to have you here with me StephiaMadelyne! Patti, were these images taken last weekend? 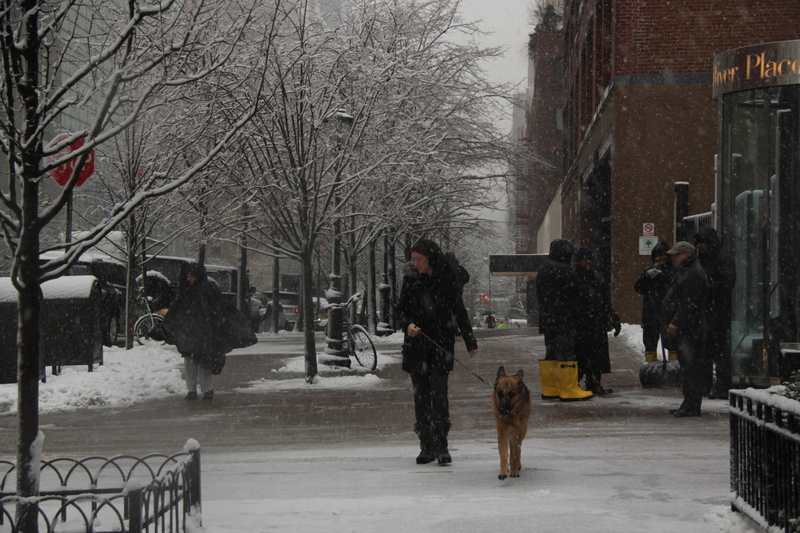 I was in the city last Friday and Saturday and this is exactly what the city looked like as I was walking to catch the train home Saturday evening….Crazy winter for us on the East Coast! Have a great week! Robyn, I know the week-end you mean and hope you made it back home without any drama! I took these shots early Feb but the winter is becoming one long white blur by now. And wishing you a wonderful week ahead as well, thank you! sorry for you, you have a very long period of cold in NY; UK is much warmer! More snow falling now Frizz but we did enjoy an almost spring like week-end! Hey Patti – you have some really great shots here – I know you’ve suffered to get them! How well I know it… I love the 7th, 8th and 10th! The angles of the 8th & 10th are great. 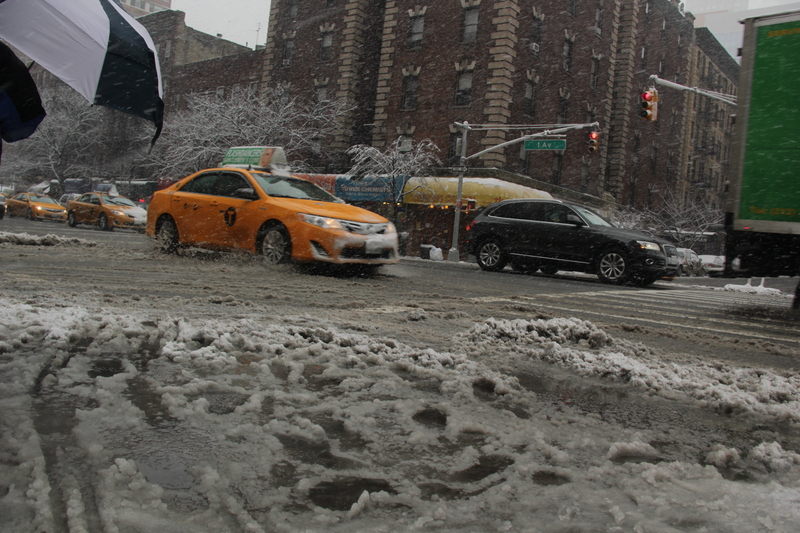 Oh, that dirty slush! You – and the rest of the region – are so going to love this spring, right? Yes, it WILL come! I felt these from the inside. Great shots. You really can do slush, Patti! wow, definitely winter. 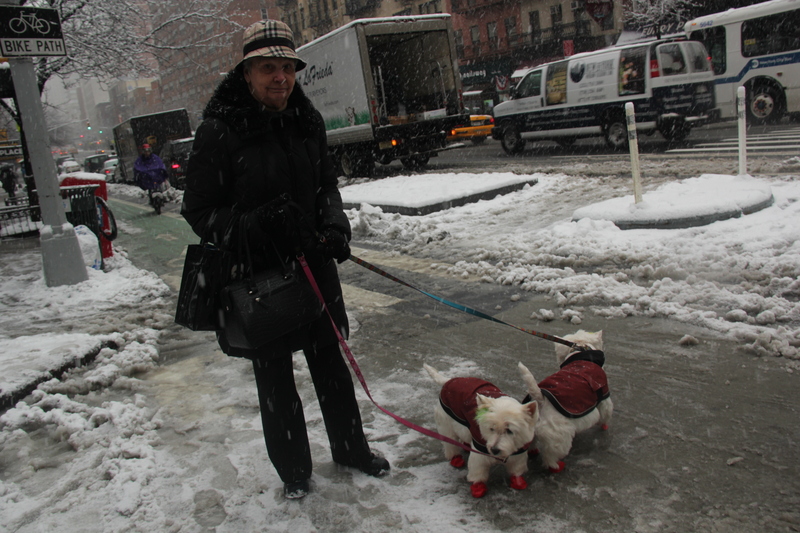 those pups in their winter gear…. all of them are brilliant. thanks for sharing. An absolute pleasure, thank you Kris!